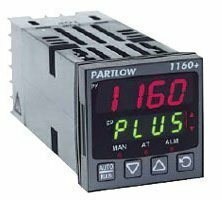 The West/Partlow 1160 is part of the Plus Series of controllers that take flexibility and ease of use to new levels. The 1160 controller is an evolved product from the West N6100. The product benefits from having more versatile features and user-friendly functionalities such as remote setpoint inputs, digital inputs, plug-in output modules, a customisable operator/HMI menu, jumperless and auto-hardware configuration, and 24VDC transmitter power supply. The 1160 results in providing a product which surpasses competitive offerings in terms of ease of use, delivery and value for money.